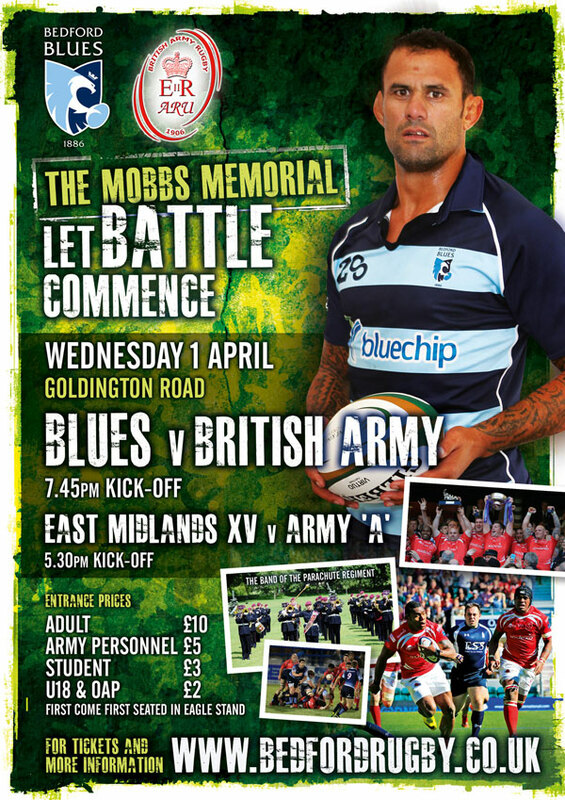 Goldington Road will be opening its gates on Wednesday 1st April for the annual Mobbs Memorial Match as Bedford Blues prepare to go to battle against The British Army (Kick Off 7:45pm). Tickets for the whole event, including an East Midlands XV v Army ‘A’ warm-up fixture are available online here at the cost of just £10 for adults and £2 for children under 16. 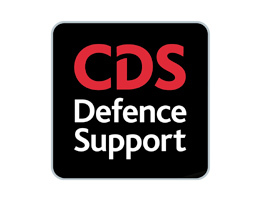 Army personnel are discounted to £5 on production of a current ID card, student entry will be £3 and there will be a special concession price of £2 for OAPs; these tickets groups will only be available for purchase on match day. First played in 1921, the Mobbs Memorial game honours Lieutenant Colonel Edgar Mobbs DSO, a true England rugby legend and a genuine hero of World War I. Some of the most illustrious names in the history of English rugby have played in the Mobbs Memorial Match in either the colours of the East Midlands or the Barbarians, who played each other each year up until 2011. Although the Barbarians announced that the 2011 fixture would be their last, the Mobbs Memorial Match lives on with the British Army facing Bedford Blues and Northampton Saints on alternate years. This year it is the Blues’ turn, and getting the event underway will be the Parachute Regiment Band who will march through the Goldington Road gates at 5pm via the Bedford Cenotaph on the Embankment where a wreath laying ceremony will be performed. Turnstiles will then open to the public allowing fans enough time to make their way to the bars before a curtain raiser between East Midlands XV and Army ‘A’ kicks off at 5.30pm. 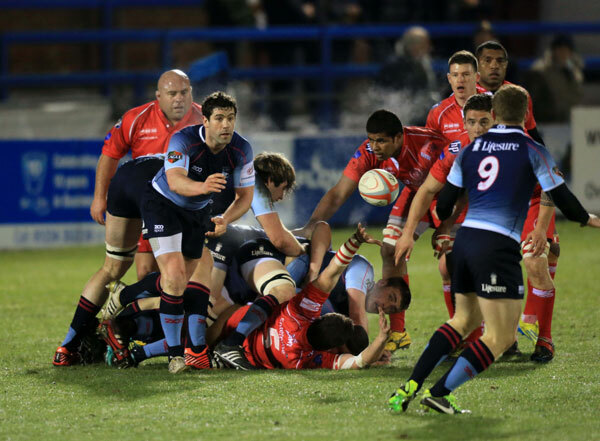 The show piece then kicks off at 7.45pm as the Blues get set to face the British Army who have been able to call up the likes of England international Semesa Rokoduguni as well as Premiership stars such as Chris Budgen and former Blue Ricky Reeves. It is also one of the final games that the Army play before they take on the Navy at Twickenham on May 9. Packed with army paraphernalia from guns to recruitment vans, this rugby-filled evening has something for everyone to enjoy, whether it’s checking out the weaponry, signing up for a career or simply cheering on the boys, there will be plenty to keep the whole family entertained. Former Bedford Modern School boy Edgar Mobbs led the East Midlands, the Midlands, the South of England and the Barbarians, as well as his club for five seasons, something which was not matched until the mid-1990s. His illustrious career included seven England caps, but he is as much remembered for what he did on the field of battle as for his rugby exploits. Having been refused a commission upon the outbreak of World War I on grounds of age, Mobbs formed his own special corps and just over a month after war had been declared 400 men had volunteered to join him. The 264 who were passed fit became known as the Sportsman’s Battalion and formed a large part of the 7th Battalion, Northamptonshire Regiment. Mobbs himself was wounded three times in battle, and in the recuperation from the one injury played his final game of rugby in 1915. His return to his Battalion – by now as colonel – after his third injury coincided with the Battle of Passchendale, during which Mobbs became one of the 420,000 men to lose their lives. He went down in folklore with the story that as he lay dying while trying to storm a German machine gun nest, Mobbs passed the map reference of the enemy to his runner to give to the Battalion Brigadier. Mobbs’ body was never found and there was no wife or child to mourn him. That did not stop a Mobbs Fund committee being formed, and the money they raised paid for a statue to honour him. Unveiled in front of thousands of Northamptonians in 1921, the statue now stands in the town’s garden of rest. All profits from the evening will be split between the Mobbs Memorial Fund and Army Benevolent Fund so be sure to make your way down to Goldington Road on Wednesday 1st April to show your support for our troops.